The RAM-137U powder coated marine grade aluminum mount consists of a double socket arm mount, one 2.5" diameter round base with 1.5" rubber ball and flat 11" x 3" rectangular plate. The plate contains different combinations of pre-drilled holes which will match up to many electronic devices and mounts, including marine GPS, CB radios, gimbal brackets and more. Rubber ball, socket technology dampens shock and vibration, as well as allows for almost infinite adjustment and perfect viewing angles. The "U" in the part number reflects product packaged in poly bag. 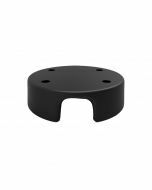 The included plate is a universal mounting bracket with a seletion of mounting hole locations. In certain applications additional holes may need to be drilled for proper fit with your electronic device.